The nature of a cash flow-based approach to financial planning, even if it is centered around the client’s goals, means that any platform assisting in the creation of such a plan should account for a few realities that clients often face, such as what to do about current overspending in a budget or unrealistic goals based on the ability to save towards those goals. In each of these cases, the client ends up with one or more time periods in which they have negative net cash flow. You as the advisor need to decide what to do about the negative cash flow, and at Advizr, we’ve recently given you another tool to help with this decision making process: a simulated loan that can illustrate what it might mean to debt finance the negative cash flow. How is this tool best used? Let’s look at a few examples. In our first case, the client is simply overspending their regular budget. This creates a negative net cash flow for the year, which in reality must be covered either by using the client’s assets to make up the difference, or by debt financing (such as credit cards, personal loans, family loans, etc.). 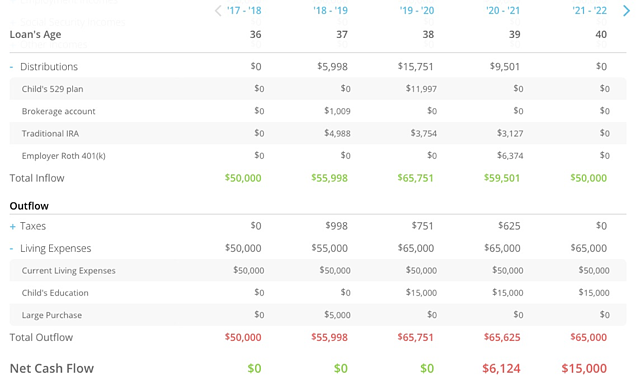 In this Cash Flow report, you can see that Ms. Loan Balance earns $50,000 per year (net of taxes) but spends $50,500 per year. In the first two years, Ms. Balance has enough in assets to cover the overspending, but in year three and beyond, she incurs a negative Net Cash Flow of $500 per year. 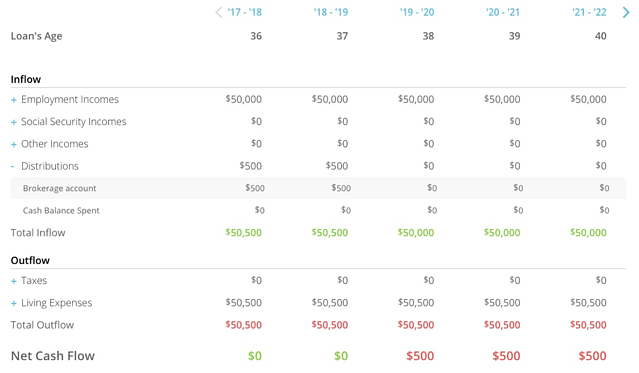 In another situation, Ms. Balance does not overspend on a day to day basis, but has told you (her advisor) about a few large goals she wishes to achieve, which are realistically unattainable based on the amounts she can afford to save. When you first run her plan and enter the Recommendations area of the Financial Plan, we assume her goals as listed in her Profile are the same as your proposals for what her goal targets should be. 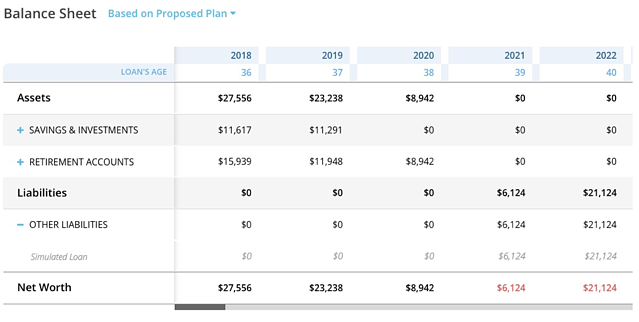 Your proposals to Ms. Balance are found in the What Ifs section of the Financial Plan > Recommendations area in the platform. 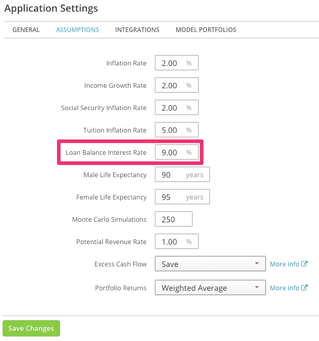 With this tool and the new Assumption for the simulated Loan Balance interest rate, found under your Settings, we give our users an additional tool to use when making recommendations to clients. As the advisor, you decide if the goal is important enough to reach that you want a client to make use of the simulated loan, or you can update your proposals to your client (“What Ifs”) to targets that are more achievable or realistic for their saving abilities. We leave that decision up to you! If you wish to learn more about our planning philosophy, we recently wrote about the history of cash flow-based and goals-based planning, and also our take on how planning language evolves from here (budget-based or non-budget-based).